Kenneth Serapio Hunter grew up in Raiti, a small Miskito Indian village located on the River Coco on the Nicaraguan side of the border with Hondurus, an area without electricity, running water, or roads. Too ill to raise him, his mother placed him in the home of a Moravian minister married to one of the first Miskito nurses. At the age of 15, Kenneth became the first person from Raiti to go to the Moravian high school in the larger coastal village of Puerto Cabezas. There he earned his room and board working as an orderly in the local hospital. After completing high school, Kenneth returned to Raiti to teach school, expanding the elementary school to eight grades. When Kenneth decided to go to medical school, he encountered the deeply ingrained prejudice against indigenous Indians. The Nicaraguan medical school of Anastasio Somoza’s repressive regime filled its fifty slots only with students from the country’s elite. Determined to pursue medicine, Kenneth applied to Guatemala’s medical school. When he was admitted, he hitched a ride from Nicaragua to Guatemala in a truck delivering mattresses. After sleeping for a period in a local park, he became the night-watchman for the mattress warehouse, while completing his studies. Immediately after the Nicaraguan revolution, Kenneth’s training was interrupted by right-wing Guatemalan death squads targeting Nicaraguans. Forced back to Raiti, he struggled to establish a desperately needed clinic. 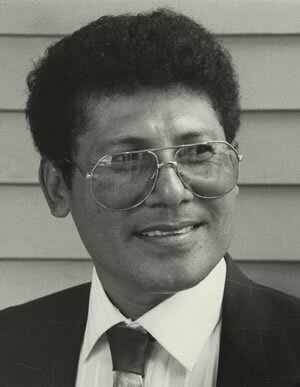 His work was again interrupted, this time by fighting between the governing Sandinistas Army and the Miskitos and by the flight of the majority of Miskitos across the border into Honduras. Kenneth used the break to start a residency in surgery in Leon, Nicaragua, until he was conscripted into uniformed medical service in the mountains of northwestern Nicaragua. In 1984, he was imprisoned and held in solitary confinement for one month by the Sandinistas because they believed he was a CIA spy. After his release, he was allowed to travel to Guatemala to straighten out his medical education records and went into exile. Once out of Nicaragua, Kenneth traveled to Honduras to serve as a doctor for the Miskito and Sumau refugee community, but was arrested by the Honduran military. Finally released, Kenneth battled Honduran discrimination against the Miskitos as severe as any he had encountered in Nicaragua. Eventually he was granted permission to practice medicine at a clinic established by the Moravian church in the tiny Honduran village of Ahuas, and soon became the director of a 30-bed clinic. In 1986, he returned briefly to Guatemala to complete special training in pediatric surgery. After it was destroyed by the fighting between the Sandinistas and the Miskitos, Kenneth rebuilt the clinic in Raiti using funds provided by the European Economic Community. In 1990 he called the repaired facility the Petra Clinic, which remains the only medical treatment center in the Miskito and Sum regions. Kenneth was named by the new Nicaraguan government head of Preventative Medicine for the North Atlantic Coast and Regional Health Administrator with the responsibility to rebuild the health care system for the entire northern border region of Nicaragua. This posting required that he become a party member, a demand Kenneth was unwilling to fulfill. Kenneth officially resigned the post, but in the absence of any other surgeon in the region he devotedly continued the work. Kenneth’s base is now in Puerto Cabezas where he works in the hospital which had been operated by Cuban doctors until the collapse of the old Nicaraguan government. In 1997, he was elected Dean of the Moravian Church University in Puerto Cabezas. In 1998, he received a scholarship from the Austrian government to pursue a master’s degree in public health.